Cooking for a group of people can be challenging. By using simple techniques and recipes, you can ensure that not only will your guests enjoy the meal, but you will as well. 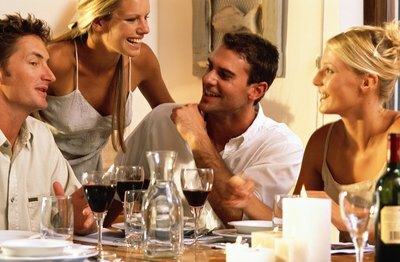 Entertaining a crowd of 10 people is a group small enough to allow you, the chef, to experiment with different recipes and create an intimate dining experience. Fondue is a dinner idea to entertain a party of 10. A fondue pot is very useful, but if you don't have one, a normal pot will suffice if you can reheat the fondue from time to time. The thing about a fondue party is that you can have an appetizer, dinner and dessert using the same cooking theme: fondue. Another thing about fondue is it brings out the host's creative side. You can use any number of items to dip into the various fondue course: bread, vegetables, chips, fruit, meat, stuffed pasta, cookies, cake and brownies. Cheese fondue is a way to start the party. There are many cheese fondue recipes available, but most have Swiss and Gruyere cheeses. Foodnetwork.com has a classic cheese fondue recipe. For the main course, create a broth in which your guests can cook their meat, vegetables or pasta. The fun of fondue is the intimacy behind everyone cooking his food in the same pot. Lastly, for dessert, offer one or two different flavors of chocolate fondue. Look at meltingpot.com for different chocolate fondue ideas. Pasta is a versatile food. If you are in a rush to throw together a dinner party for 10, think of serving a pasta bar. The idea is very simple: cook enough pasta for 10 people, then create three or four different sauces and let everyone decide which kind of sauce he or she would like on his individual serving of pasta. You can also get creative and have different cheeses available for your guests to top their pasta with and also have different meats or vegetables for everyone to mix in to their individual dinners. The level of creativity and amount of food you want to have available to your guests depends on how much time you have, but the basic idea is to let everyone create their own meal. Go to foodnetwork.com for various pasta sauce recipes. 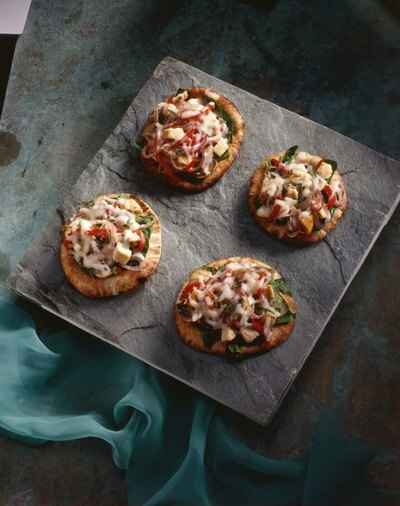 Similar to the idea of the pasta bar, personalized individual pizzas are an idea for a dinner party of 10. All you need to do is to roll out 10 individual pizza crusts, cut up some meats and vegetables for the pizza, and let your guests do the rest. You can create an upscale feel to this rather childlike tradition by having unique topping choices such as roasted red peppers, spinach, or shaved Parmesan cheese. For a great pizza dough recipe, go to cooks.com. You can even carry the pizza idea onto dessert by making a dessert pizza. Simply buy a roll of sugar cookie dough from the grocery store and roll it out in a circular shape to about a 1/4 inch thickness. Bake as directed and spread the entire crust with cream cheese frosting. Top the frosting with different fruits such as strawberries, kiwis and raspberries. Slice like a pizza and serve. 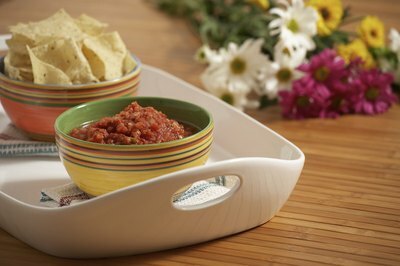 Another way to entertain a party of 10 with ease is to make various dips and serve with various dippers. For example, serve guacamole with tortilla chips, salsa with chips, hummus with vegetable crudite, baba ghanoush with pita bread, and spinach artichoke dip with sliced French bread.